Hilton Grand Vacations has enjoyed another period of “strong operating performance” after reporting its second-quarter results for 2018. Diluted EPS was $1.10 and net income was $107 million for the second quarter. Adjusted EBITDA was $175 million for the second quarter. Contract sales for the second quarter increased 10.5 per cent from the same period in 2017. Net Owner Growth (NOG) for the 12 months ending 30 June 2018, was 7.2 per cent. Acquired the Quin in New York City for $176 million with plans to convert existing hotel rooms into 212 timeshare units. Announced it made a $41 million deposit to purchase 87 of the 375 hotel rooms within the Hilton Los Cabos Beach and Golf Resort in Los Cabos, Mexico. Opened The Residences by Hilton Club in New York City and began sales at Ocean Enclave in Myrtle Beach, South Carolina. Adoption of ASC 606 increased second-quarter reported revenues and operating expenses compared to the previous accounting guidance. Under the previous accounting guidance, second quarter revenue, net income and adjusted EBITDA increased 8.9 per cent, 27.5 per cent and 12.3 per cent respectively. For the three months ended 30 June 2018, diluted EPS was $1.10 compared to $0.51 for the three months ended 30 June 2017. Net income was $107 million for the three months ended 30 June 2018, compared to $51 million for the three months ended 30 June 2017, and adjusted EBITDA was $175 million for the three months ended 30 June 2018, compared to $106 million for the three months ended 30 June 2017. Total revenues for the three months ended 30 June 2018, were $563 million, compared to $439 million for the same period last year. Adoption of ASC 606 – under which sales of Vacation Ownership Intervals (VOIs) and all related direct expenses for projects under construction are deferred until construction is fully complete – increased revenue for the three months ended 30 June 2018, by $85 million compared to the previous accounting guidance. The comparable increase was $42 million to net income, $0.44 per diluted share to EPS and $56 million to adjusted EBITDA. 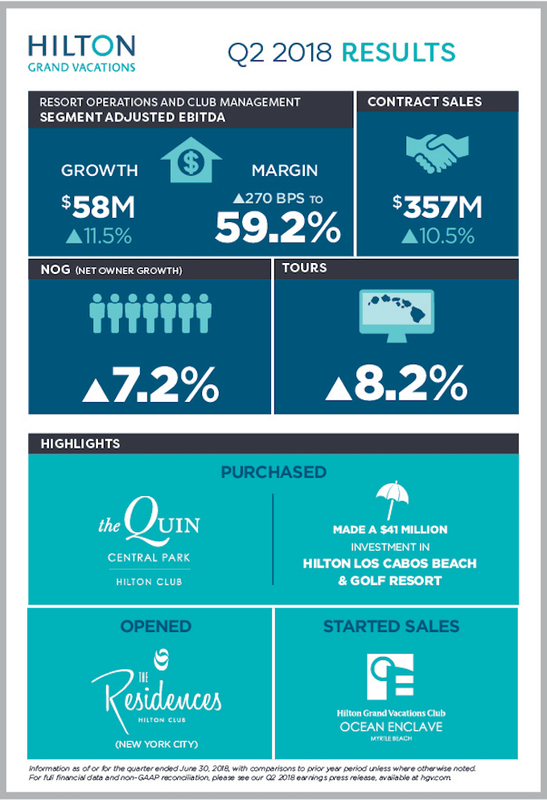 Mark Wang, president and CEO, Hilton Grand Vacations, said: “The solid execution of our teams in the U.S. and Japan has delivered consecutive quarters of strong operating performance, including contract sales, Net Owner Growth and strategic deployment of capital. To read the full HGV announcement, click here.